Your Pages is exactly as the name implies...pages that you've created, either purposefully, like scoring wines or saving wines to lists, or indirectly, like when I make recommendations for you based on the wines that you've rated and you like. ​I encourage you to rate wines as you browse through this website. The more wines that you rate, the better my recommendations will be. That's because every time you rate a wine (score it 1-5 stars) I dissect its flavour and aromatic profile, the winemaking style and its weight or body. As you rate more and more wines, I can start to determine what flavour profiles and styles you prefer and begin to make recommendations based on your preferences. 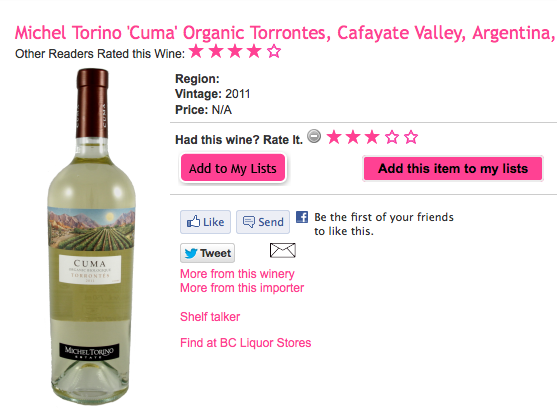 If you've tried a wine, rate it by scoring the wine 1-5 stars on the individual review. The more wines that you rate, the more wines I can recommend. Get started by rating some wines (scoring them 1-5 stars) from this list I have provided. These wines are top sellers and reader favourites. Chances are you've tried some of these wines and probably liked a few. I can dissect what it is those wines have in common and then recommend wines that are similar. style and its weight or body. Don't be surprised to find some big white wines or old world reds in my recommendations for you. If you haven't already done so, try rating some wines from this list of top sellers and reader favourites. Or, take a look through some of my most recent reviews and begin scoring them between 1-5 stars now!